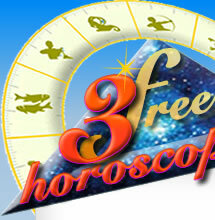 a click away from your free online horoscopes ! Just add a bookmark to your browser and you are started ! Optimized for PC, MAC, Tablets and mobiles as iPad, iPhone Android etc. 3horoscopes.com web site is better than any app. It's instantly available without installation and remains 100% free. 3Horoscopes will never use your personal data, never ask for any system nor device update; 3horoscopes.com is contantly updated ! Registration is private and your data will never be shared.